Everspin, the spin-out of Freescale Semiconductor attempting to make magnetic random access memory work, said it had shipped 4 million MRAM devices in 2011 and that Dell and LSI use its products in their storage gear. This is good news for the Chandler, Ariz.-based company, which has found a niche market in the small controllers that reside inside storage gear and capture the metadata that tells the computers where to put the stored data. But CEO Phil LoPresti, who joined the company in 2010, has a bigger target in mind. He wants to exploit a variation of the magnetic technology that allows MRAM to work to build denser memory that could eventually replace DRAM, the Big Kahuna of device memory found in everything from computers to game consoles. But before we get to those claims, let’s focus on the product shipping today. Everspin isn’t the only company trying to make MRAM devices, which are valued because they are non-volatile forms of memory: They hold their data even when the power is turned off. This makes them good for areas like the journal memory in RAID storage boxes, which is what Dell (s dell) and LSI use Everspin’s devices for. Alternative forms of memory (mostly SRAM) require a battery hooked up to the boxes to ensure that if the storage box fails, the memory can be recovered. However useful MRAM is for that arena, it’s stuck in a niche unless Everspin can figure out how to scale the densities beyond the current limit, which is 16 MB. For context, the lowest-end iPad (s aapl) can store roughly a thousand times more data on its flash memory. 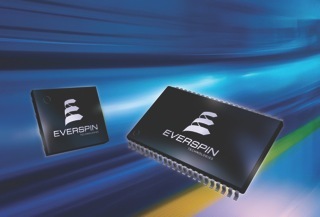 Everspin expects to sell 4 million to 6 million more MRAM devices during 2012, said LoPresti, but the company’s biggest efforts are focused on a new technology called spin torque RAM, which he believes could replace DRAM beginning in 2015 or 2016. Given that DRAM’s about a $26 billion annual market, that’s a pretty big claim. MRAM works by depositing three layers on top of a circuit. The first layer is composed of a magnetic thin film that is “pinned,” so it spins in the same direction. The middle layer is allowed to spin freely, and the top layer is polarized so the electrons can be programmed to either spin one direction for a one and the opposite direction for a zero (ones and zeros make up the binary “language” chips understand). The middle layer acts as a conductor between the top and bottom layers, and if the spins match up, a current flows through. Those currents are what the chip reads as ones or zeros. The ST-RAM, or spinning torque RAM, is similar but will require less current to toggle the different zero and one states, which means one can cram more transistors on a device without requiring prohibitive levels of current. That allows an ST-RAM chip to store more data, which is one way it could compete with DRAM. Of course, in my years covering chips, I’ve heard plenty of companies claim they have the next DRAM, and so far, we’re still using the stuff. Everspin are not “attempting to make MRAM work”, they have been in production for over 4 years now. They make it work, and were the first company to go into production in this technology.